Noah Elliott used to be a beloved member of the Starlight Bend community, until a tragedy turns to an ultimate betrayal and he is driven into solitude. His face horribly scarred, he retreats to his mountain top mansion--until a stubborn social worker is brave enough to face the beast, and ask for a special Christmas wish to help a sick child. When Noah agrees to help, he never considers he might fall for the spitfire, do-gooder. But when she offers love as the solution, will he be able to let go of the past? Josephine Whitman has one shot at making a holiday wish come true--and it all hinges on Noah Elliott. She gets him to agree to host a Winter Carnival, and finds herself intrigued by the gruff, fascinating man hiding a bruised heart. But will her love be enough for him to take a chance on a brand new future? 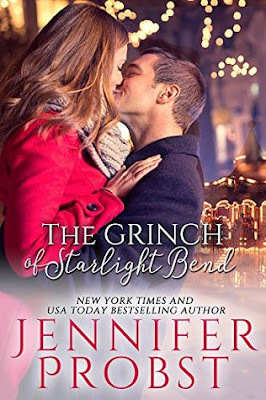 This novella was originally released in Holiday Heat: The Men of Starlight Bend. I read this book Christmas Eve and it was perfect for that night. It's a modern twist on Beauty and the Beast, but with a magical, Christmas twist of Joey trying to make a sick little boy's dream come true, something that can only happen with Noah's help. It's a fast story, so things happen fairly quickly between the two of them, but I didn't need any more depth than what was there. The backstory for Noah and what happened to him was incredibly sad and I wished we'd seen a bit more of his misinterpretation of what happened between him and the town and his discovery of how he'd misread things. But overall, it was a fun, quick entertaining read that satisfied for a good holiday romance.